Microbe-Lift Fish Medications Reduce the potential for common diseases and treat current with Microbe-Lift's complete product line of fish health treatments. 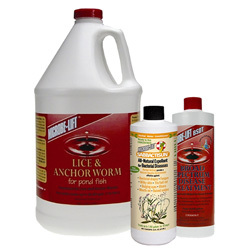 Microbe-Lift Lice & Anchor Worm is the most effective treatment for diseases of fish caused by lice and anchor worms. When used as directed, it will not harm biological filtration and may be used on scaleless fish. Can be used in any water temperatures above 40º F. Should be stored in the original container above 40ºF and under 100ºF. Do not store in direct sunlight and do not allow to freeze. This product is intended for use with all ornamental pond fish. Not for use with fish or aquatic invertebrates intended for human consumption. Not for human or veterinary use. Prior to the initial use, a partial water change of 20% is recommended. This removes pollutants for disease-causing organisms and will reduce the number of water-borne pathogens. For best results, perform three treatments one week apart with water changes prior to each re-treatment. Contraindications: Safe for use on all ornamental pond fish, reptiles, amphibians and mollusks. Must NOT be used where crayfish and other crustaceans are being cultured. Keep out of reach of children. Shake well before use. A unique, natural parasite repellant. Proven to work against bacterial dropsy, fungus and ulcers in fish. Expels pathogens from fish and stimulates its immune system response. Can speed up damaged tissue regeneration. A unique, natural parasite repellant. Proven to work against skin flukes, gill flukes, white spots, Oodinium, Costia, Chilodonella and Trichodina. Made with plant and herbal extracts making it environmentally friendly. Supports immune system, driving off the excess parasites. Product is harmless to all nitrifying filter bacteria and aquatic plants. MICROBE-LIFT/Stress Relief is not a medication and should not be used as a substitute for any recommended medication. Aloe Vera has been proven to regenerate raw tissue, blood spots and help to replace damaged slime coats. When fish are transported and placed into new environments, stress is generally exhibited. Also, use MICROBE-LIFT/Stress Relief any time fish are sick to accelerate the healing process. Heavy metals in the pond water may be lethal to your fish. MICROBE-LIFT/Stress Relief helps to detoxify the free ions in zinc, copper and iron. This product is intended for use with all pond, ornamental and aquarium fish and may not be used with fish intended for human consumption. Provides a natural pond eco-system, resulting in better overall fish health and improved water quality for use with all ornamental, coldwater, temperate, cyprinids, native and wild species. It is easier to prevent disease than cure it, and good water quality is a keystone for disease control. Microbe-Lift/Therapeutic Salt For Ponds & Quarantine Tanks reduces the amount of energy a fish must expend to maintain osmotic balance, in fresh water fish, this energy can be substantial. If your fish is suffering as a result of a nitrite spike (a.k.a. Brown Blood Disease), ML/Therapeutic Salt For Quarantine Tanks acts to slow the rate of nitrite uptake - possibly the difference between survival and death, with electrolytes, minerals and Allantoin, which accelerates wound and fin healing, ML/Therapeutic Salt provides the necessary elements pond fish require to reduce stress and develop a healthy slime coat. Be especially careful when adding any salt to tanks containing aquatic plants as salt can have a toxic effect. Before adding salt, remove any zeolite products. Fish emit excessive amounts of ammonia when salted, so test your water for ammonia spikes with Microbe-Lift/Ammonia Test Strips. Don't overdose. Small Tank: 1/2 cup (120 g) per 10 gal. (38L) of water. Large Tank: 5 cups (1.13 kg) per 100 gal. (378L) of pond water. For Stress Reduction: 2 tbls. (30 g) per 10 gal. * 1 1/2 cups (360 g) per 100 gal.